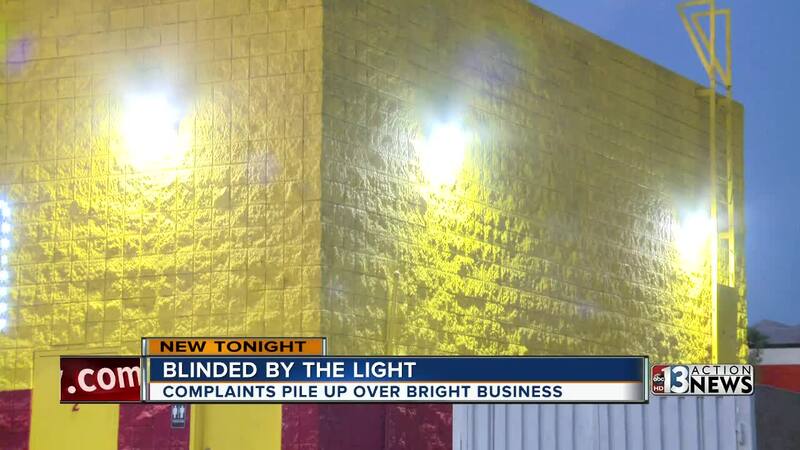 Neighbors say a tire and repair shop has invaded their neighborhood creating an eyesore that is sending light into their homes even after the shop closes each night. Some neighbors are even circulating a petition calling for changes to limit the impact of the tire shop at Charleston Boulevard and Lamont Street. They have 20 signatures on the petition in an area with just over a dozen homes within line of sight of the tire shop. They want the business that opened earlier this year to build a wall to block the view of the "brilliant yellow" paint on the building or repaint the shop altogether. "If they want to have the yellow they can have it on Charleston," Kerry Hyt said of the building that borders Charleston Boulevard on the north and Nevada Street to the south. Hyt said the eyesore across the street is causing problems for her rental homes she has owned for more than 20 years, saying longtime tenants moved out of one house because of the constant light coming through the windows each night from the lights on the shop. "If you are here you can't open your blinds to see outside," Hyt said. Hyt said she has reached out to the Clark County Commissioner Chris Giunchigliani and was told the color of the building is permitted. The commissioner also told the homeowner she is working to get the lights facing the homes dimmed. Giunchigliani confirmed those statements to 13 Action News adding the owners of the building have done everything asked of them by the county. An employee at the shop said they are aware of the concerns and the owner is working to address the neighbors concerns with the landlord.